Amtrak Acela Test Trains Page 1-of-3-! !-Stan's RailPix. Amtrak Acela Test Trains Page-1 of 3-! -Click here to see New York Central "High-speed" railcar M-497, put together by the NYC Railroad in 1966. This first "High-speed" railcar, was a 13 year old Budd RDC (rail diesel car) that had once run in the Boston and Albany Beeliner Fleet. The diesel engines were disconnected and 2 GE J-47 turbojet aircraft engines were mounted on the roof. The car had a streamlined front, and special cylindrical tread wheels were installed. New York Central Railroad Publicity Photo. -Click here to see New York Central "High-speed" railcar M-497 on a test run between Butler Indiana and Stryker Ohio. 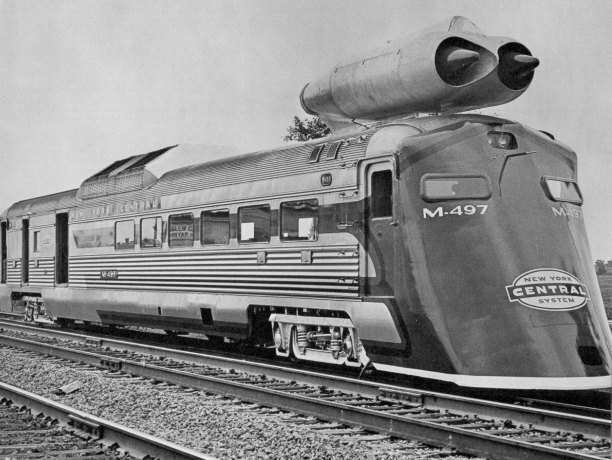 The M-497 reached a record speed of 183.85 miles per hour. The test was run to prove that high speeds were possible on existing track and roadbed. 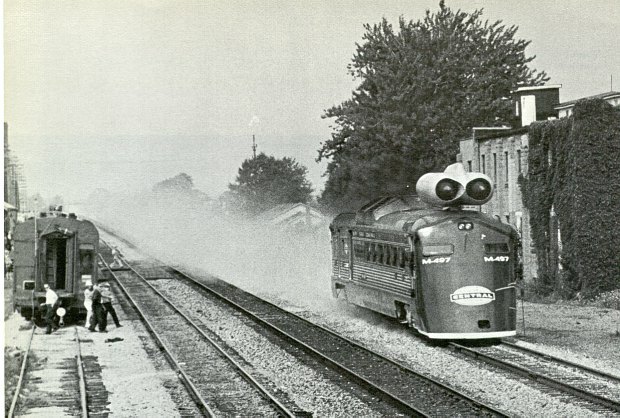 July 23 1966, New York Central Railroad Publicity Photo. 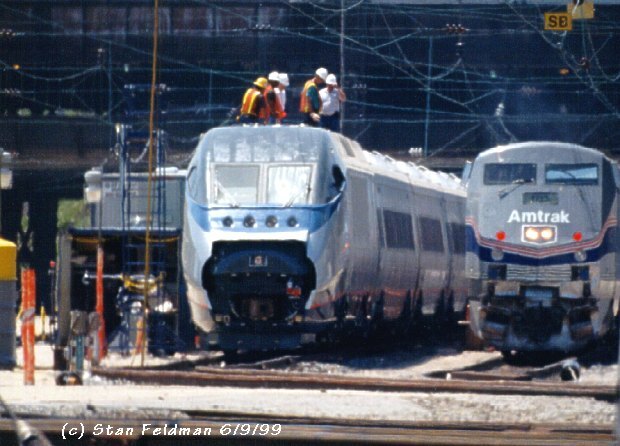 -Click here to see men working on top of Amtrak Acela Acela HSEL (High-Speed Electric Locomotive) #2001, rated at 6250 H.P. The power car and train set will be testing systems and controls. Penn Coach Yard, Phila. Pa. 6/9/99. -Click here to see Amtrak Acela HSEL (High-Speed Electric Locomotive) #2004, rated at 6250 H.P. leading an Acela Express Trainset Test run. 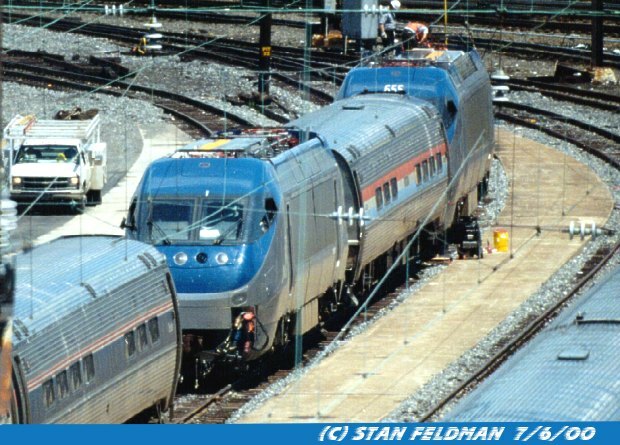 On the rear is Amtrak Acela HSEL #2005. They are running east (north) on the Northeast Corridor approaching Tacony Station ,(MP-78.2) Phila. Pa. 4/20/00. -Click here to see Amtrak Acela HSEL (High-Speed Electric Locomotive) #2005, rated at 6250 H.P. on the rear of an Acela Express Trainset Test run. 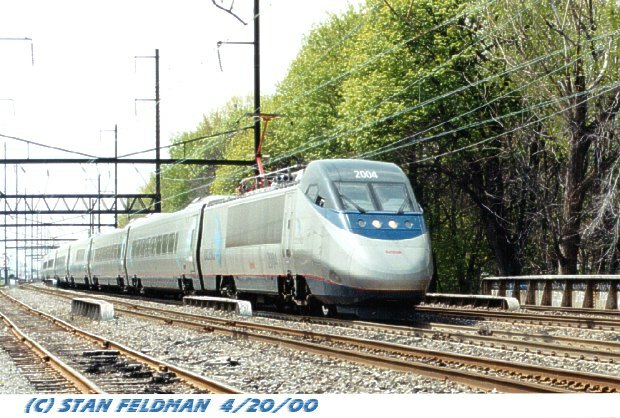 On the front is Amtrak Acela HSEL #2004. The train is running east (north) on the Northeast Corridor toward Holmesburg Junction, Philadelphia Pennsylvania. 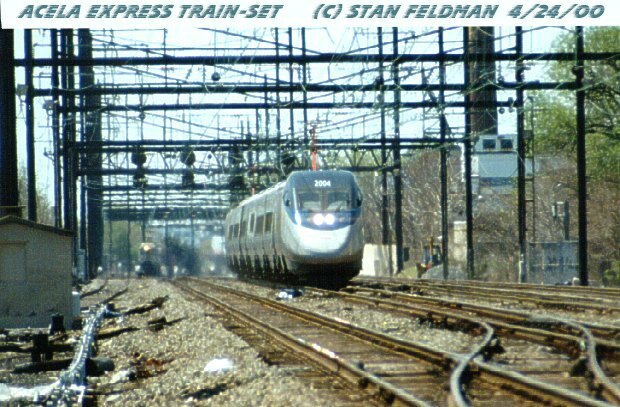 The Acela Test train will stop at Newark N.J, and return with Amtrak Acela HSEL 2003 in the lead. 4/20/00. 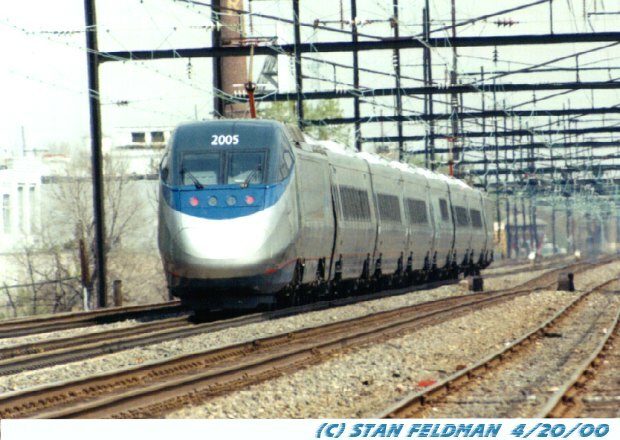 -Click here to see Amtrak Acela HSEL (High-Speed Electric Locomotive)#2004 on the rear of a test train on the curve at Frankford Junction, Phila. Pa. 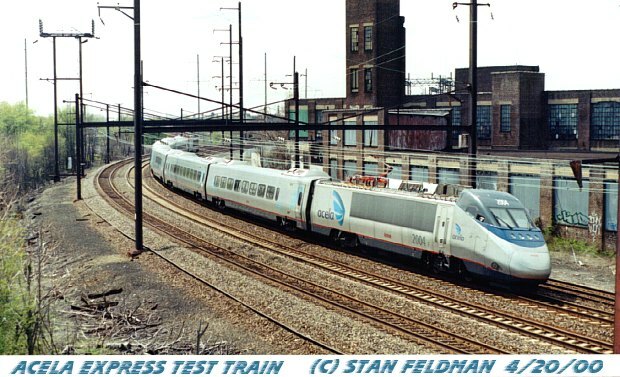 The Test Train is returning to Penn Coach Yard, Phila. Pa, from Newark NJ. 4/20/00. 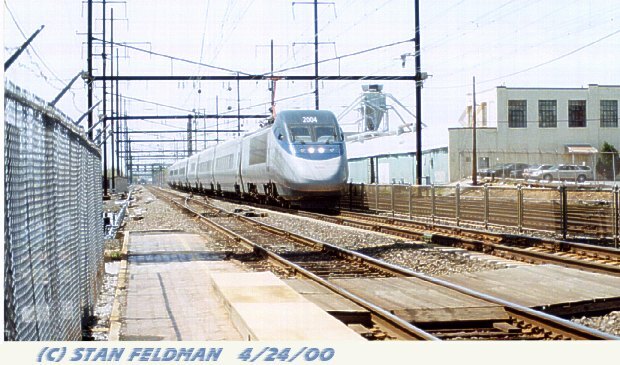 -Click here to see Amtrak Acela HSEL (High-Speed Electric Locomotive) #2004 at Holmesburg Junction, Phila. Pa. The Amtrak Acela Express Test Train will run to Newark N.J., then return to Philadelphia Penna. 4/24/00. 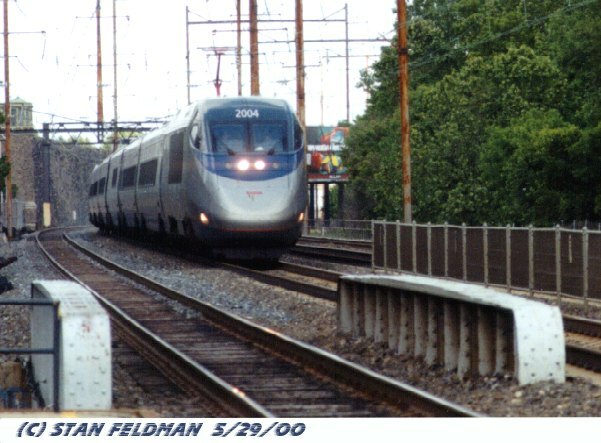 -Click here see Amtrak Acela HSEL (High-Speed Electric Locomotive) #2004 leading a test train westward-southward at Holmesburg Junction, Philadelphia Pennsylvania. The green tower in the top left of the picture is Holmesburg Prison. 5/29/00. -Click here a short test train, with men working on top of Amtrak Acela HHP-8 #655 in front, and an unnumbered Amtrak Acela HHP-8 on the rear. Penn Coach Yard, Phila, Pa. 7/6/00. Click here for PAGE 2, OF ACELA TEST TRAINS.